Resitors are often used to limit the current. 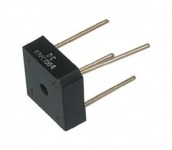 Rectifiers convert alternating current voltage (AC) in direct-current voltage (DC). Those are often found on power supplies and amplifiers.